My Green Lab, Sustainability Made Simple, and the International Living Future Institute invite you to join the Procurement ACTivists. What are the Procurement ACTivists? 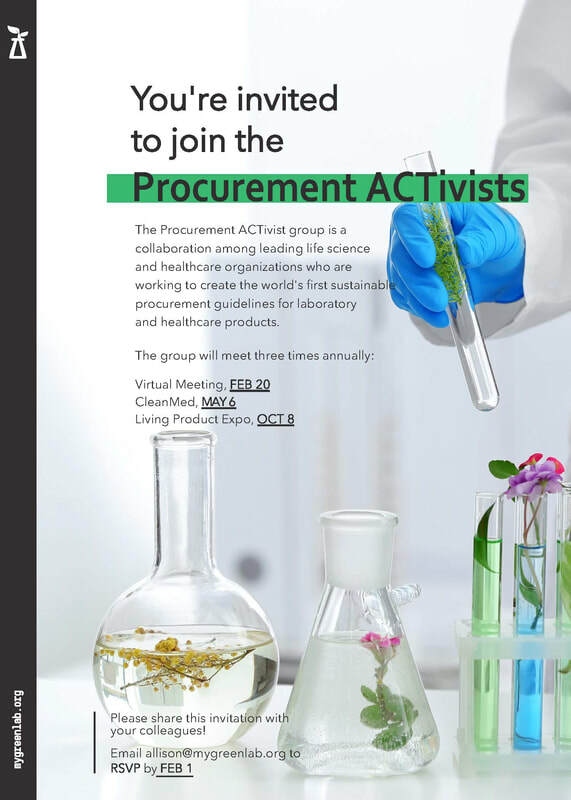 The Procurement ACTivists are a collaboration of leading life science and healthcare organizations who are working to create the world’s first sustainable procurement policies for laboratories. When will the Procurement ACTivists group meet? Our first meeting will be February 20th at 9am PST via teleconference. Please RSVP by February 1st to join our first meeting. And please feel free to share the attached invitation with your colleagues. Why did the Procurement ACTivists start? Collectively, procurement specialists around the world have the power to affect transformative change in the laboratory products industry. The Procurement ACTivist group will be the place for procurement specialists to join together to make their voices heard. In the words of Simon Sinek, “Words can inspire, but it’s action that creates change”. This group will inspire sustainable action among each organization, and share best practices for integrating the ACT label into existing procurement platforms. It will take all of us to create the change we need. We are looking for new members to join this group. If you are actively building a sustainability program or thinking of starting, please contact us for more information. Who should join the Procurement ACTivists? We look forward to speaking with you on February 20th at 9am PST. As a reminder, please RSVP by February 18th to receive the call-in details.